With the second update of the season things are starting to take better shape. When a team stumbles out of the gate it’s easy to chalk it up to slow start or early season jitters, but once clubs have a dozen or so games under their belt its a little easier to determine if a remarkable weekend, for better or worse, is a indicator of potential postseason success. With that some clubs which had generated a few more losses than anticipated started to slide down the rankings this week after given the benefit of the doubt previously. On the other side of the coin, schools which had unexpected wins before were legitimized and started creeping their way towards the single digits. For the most part results across the three small school divisions went as anticipated last week. There were a couple of surprises on the diamond which resulted in some minor table tweaking, but nothing to tip either of the three rankings rosters on its side. Rankings are based on games through Sunday, Feb. 26. The biggest move up the rankings this week was made by Flagler. A late Nova Southeastern rally usurped upstart Flagler’s opportunity for a road win over reigning national champions, but the Saints did earn a three-game sweep over conference rival Georgia College to make a move up the rankings. Their wins over the Bobcats pushed their victory total to 12, a mark they didn’t reach until deep into March last season. The Saints jump into the top 20 at No. 15 and will have a Sunshine State showdown this upcoming weekend when they host top ranked Tampa. A pair of wins over the Spartans could propel the Saints into the top 10. Leaping into the rankings for the first time this season are the Lynn Fighting Knights. On the heels of their staggering series win over North Georgia the previous week, the Knights swept Florida Southern convincingly, scoring double-digit runs in each of the contests. As impressive as the lineup has been, it is a pitcher who is putting up the most jaw-dropping numbers. Donovan Armas, who had a 7.88 ERA in 69 2/3 innings last season, has been pitching out of his gourd in 2017. In four starts he’s earned a 0.67 ERA in 26 2/3 innings while only allowed a dozen hits while striking out 30 batters. Armas and the rest of the Knights have an opportunity for a third tremendous weekend in a row when they play a must-watch series with Nova Southeastern. A trio teams which have been constantly creeping down the rankings are West Florida, Lubbock Christian and Belmont Abbey. Each of them started the season in the top 10 but have not been living up to their lofty expectations. The Argos and Chaparrals remain in the Top 25 despite each having a half-dozen losses in the early season, however the Crusaders fell out this week after their defeat total reached eight after loses. While the white flag hasn’t risen from either of these clubs yet, they’re each in need of some quality wins to show they’re too legit to quit. Dropped out: Florida Southern (18), Florida Tech (20), Belmont Abbey (22). The sensational start by Southeastern was mentioned previously, but another winning week bears another mention. The Fire pushed their undefeated season start to 16, their highest streak since joining the NAIA in 2009. The Fire are hitting .374 as a club and have doubled their opponents’ totals in triples, home runs and stolen bases. The pitching staff is striking out over a batter per inning and has only issued 47 walks in 126 innings with a 3.21 ERA. Their winning ways should continue deep into March with some so-so teams from north of the Mason-Dixon line on tap heading to town. The Fire don’t have a series with a currently or likely-to-be a ranked opponent until early April. Nevertheless, the mat could be pulled out from them easily if they can’t continue to impress over marginally impressive competition. Oklahoma Wesleyan made another upwards move after sweeping three games from previous second-positioned Bellevue. At the beginning of the season Head Coach Matt Parker remarked that his pitching staff was perhaps the best and deepest he’d had while on campus. That certainly showed last week as Eagles hurlers dominated the Bruins, only allowing a total of five runs over three games. In the finale Carlos Aldana only allowed a pair of hits to lower his ERA to a dainty 1.35. After hosting St. Gregory’s midweek, OKWU starts a series with Sterling, an enigmatic club which had been ranked earlier this year after punishing opposing pitchers twice for 20 runs, but were made to look rather pedestrian this past weekend. One of the teams which aforementioned Sterling manhandled earlier this year was Wayland Baptist. The Pioneers opened 2017 scoring 63 runs their first three games and projected to be even better than last year’s WBU team which compiled their best season in school history and and finished in the top 10 nationally in slugging percentage and in the top 20 in batting average, doubles, triples, home runs per game and RBI. Baptist took four more losses to the chin over the weekend to a fellow Pioneer mascotted school, MidAmerica Nazarene. The Nazarene sweep, along with a win over York, moved them into the Top 25, while the losses dispatched Wayland from the list. Dropped out: Sterling Warriors (17), Wayland Baptist Pioneers (20), York Panthers (22), Central Baptist Mustangs (25). Many of the top D-III teams fattened their records with lopsided contests against outclassed opposition last week. For example, Birmingham-Southern cruised past North Park (although the Panthers did also manage a pair of impressive wins over Washington as well), Emory easily handled Huntingdon, Shenandoah had little trouble with Case Western Reserve and Centenary absolutely annihilated Rust, scoring an ungentlemanly 80 runs in four games against the Bearcats. The as-anticipated results allowed for minimal movement in the overall rankings. One team that has been classing up the Top 25 are the LaGrange Panthers. 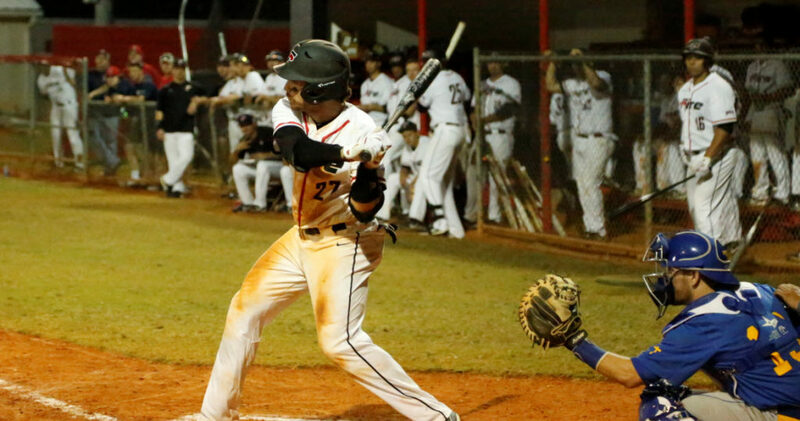 After earning three wins over Covenant, the Panthers pushed their record to a lofty 12-1. If LaGrange is able to take care of business in the USA South, their non-conference March matchups against Emory and Birmingham Southern could eventually earn them a spot in the top 10. For those wins to happen however, they may have to push their most successful starter into a midweek role to face such arduous opponents. Andrew Weekly has unquestionably been the Panthers’ most prominent pitcher, only allowing 1.80 runs per nine innings with a 25-to-4 strikeout-to-walk ratio in 30 innings. Making their 2017 debut in the Top 25 are the Beavers of Buena Vista. BVU had three unchallenging wins in which they outscored their opposition 33-6. The Beavers will be playing out of hotels for the next several weeks and should probably pack and wear their batting helmets when they make their way into Minneapolis’ new U.S. Bank Stadium whose shiny design has made it a precarious bird killing magnet. They’ll also need to plenty of sunscreen for a trip down to Tucson the second half of March. Buena Vista will be the top team in both those locations and will have the opportunity to beef up their own record as they prepare for their challenging IIAC schedule. Dropped out: Occidental Tigers (19).